This simple tri-colour LED flasher circuit is great for beginners. 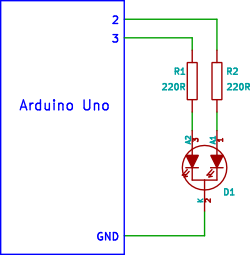 The three pin tri-colour LED is controller by an Arduino Uno and changed between three colours. This video shows the Arduino running a sketch that controls the tri-colour LED. The circuit is very simple, using only three components. The tri-colour LED is a three pin common cathode type containing a red and green LED. The tri-colour LED is the same LED used in the tri-colour LED transistor flasher circuit – refer to this project for more details on the LED. The sketch changes the colour of the LED every second. Colours are changed by switching on the red LED in the tri-colour LED package, then the green LED, orange is obtained by switching on both the red and green LEDs at the same time. Description:  Changes the colours of a tri-color LED. Hardware:     Arduino Uno and tri-colour LED.